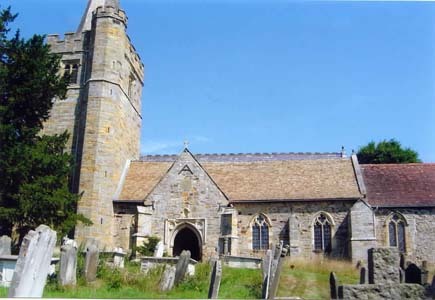 Thomas Hickmott (1769-1854) and Elizabeth Wibley (1766-1837) were married at St Mary's Church of England (pictured on the left) at Lamberhurst in Kent on 2 May 1788. The registration of marriage shows that Thomas was 'of this parish' and he was both a minor and a batchelor. Elizabeth, the daughter of David and Elizabeth W(h)ibley, was a spinster from the parish of Frant. The couple were married by William Liptrott by licence and with the consent of Thomas' parents. They signed the certificate with a 'mark' and in the presence of Robert Figg and Samuel Martin. It seems that Thomas and Elizabeth lived all their lives at Lamberhurst although it is possible they may have spent some of their time at the nearby village of Staplehurst (where some of their children were married). We think that Elizabeth died at Lamberhurst in 1837 although that has not been confirmed. The 1841 census shows Thomas Hickmott, a 70 year-old agricultural labourer, living at 'Furr Fritt' Cottage in Lamberhurst (the census has another Thomas Hickmott, a 70 year-old agricultural labourer, and his wife Elizabeth living in the village of Staplehurst). In 1851, the widowed Thomas, now aged 83, was living on Jarrett's Road in Lamberhurst with his son Charles and his family. We have yet to determine when and where Thomas died. The local parish records indicate that Thomas and Elizabeth had twelve children all born at Lamberhurst: Susannah (1788-1805), Edward (1790-1871), Thomas (1791-4), Thomas (1793-1872), Mary (1794-1854), William (1796-1860), John (1797-before 1851), Samuel (1799-after 1872), Elizabeth (1801-47), Charles (1802-60), Harriet (1805-unknown) and Sarah Ann Hickmott (1807-unknown). As shown, two of these - Susannah and their first Thomas - died young and were buried at Lamberhurst. We have not been able to determine with any certainty the fates of their two eldest daughters, Harriet and Sarah Ann. Two of their sons, Samuel and Thomas Hickmott were convicted of larceny and transported to Van Diemens Land in 1840. As described below, their remaining six children remained in England, spending their married lives either elsewhere in Kent or, in one case, in Surrey (the details of their spouses and families are shown on my Rootsweb site, the Hickmott Family). Thomas and Elizabeth had at least 40 grandchildren we are aware of. Three of these - Henry Hickmott (1825-1914), Mary Ann Wright nee Jenner/Hickmott (1835-1920) and Caroline Hickmott (1842-1907) - emigrated to Australia in 1849, 1863 and 1871 respectively. Although still to be confirmed, we think another of their grandsons, James Hickmott (1809-81), emigrated with his wife and son to New South Wales in 1838. Two further grandchildren - William Richard Hickmott (1833-1908) and Harriet Hannah Beecher nee Hickmott (1829-after1875) and their respective families went to live in the United States in 1857 and 1858. Edward may have been a witness at his younger brother Samuel Hickmott's marriage to Harriet Hartridge in Staplehurst in Kent on 25 January 1819. The Poor Law records for Marden include, in 1822, an 'order on Edward Hickmott of Staplehurst, farmer, for the daughter of Mary Ann Webb, born at Marden on 14 February 1819'. A further order was placed on him in 1826 'for the son of Mary Webb born at Marden on 15 February 1823'. The Mid-Kent Marriage Index shows that an Edward Hickmott married Elizabeth Jenner at Maidstone in Kent on 7 February 1841. The 1841 census shows an Edward and Elizabeth Hickmott together with Elizabeth's six year-old daughter, Mary Jenner, living at Plain Farm near Staplehurst. Also present were Edward's brother William Hickmott and his wife Hannah [Wingate] and their five children. By 1851 Edward (60) and Elizabeth (37 and born at Cranbrook) had moved to Clapham in Surrey where Edward was working as a dairyman and beer seller. Also present were two of their children: Caroline (9) and Charles Hickmott (7). Edward and Elizabeth remained at Clapham for the remainder of their lives, she dying there in 1867 and he four years later. They are both buried in the South Metropolitan (Norwood) cemetery. 1.1 Mary Ann Jenner (1835-1920). ...emigrated to Queensland in 1863 and came to Adelaide in 1865. He first entered the service of Messes McArthur, Kingsborough & Co and was with Mr Edward Spicer for a short period before he joined the postal service as a clerk in 1866. The deceased was mail agent on board the branch mail steamers which ran to and from King George's Sound, and had charge of the sorting of the mail en route, from December 1866 until this service terminated. Up to 1876 he acted as mail agent at Glenelg, to receive the English mails landed there, and was issuer of stamps and clerk in the money order office during 1877. Subsequently he filled the position of inland clerk and senior inland clerk ... before being appointed, in June 1884, to the position of chief clerk in the letter branch ... [and later] superintendant of the mail branch.... [there followed more details and some of his reminiscences] ... Mr Wright has left a widow and three children - Mrs C. M. White (Malvern) and Messes G. E. H. and C. T. Wright, the latter of whom is English mail officer at the GPO. 1.1.1 Charlotte Elizabeth Wright (1864-1951) who was born in Queensland and married Charles Montegue White (1866-1952), the son of Frederick Richard and Eleanor White nee Miller, in Adelaide in 1893. They lived all their lives in Adelaide and had two children we are aware of there: 1) Eric Barnard White (1895-1982) who enlisted in the 1st AIF while studying as an engineering student in 1916, served in the 5th Pioneer Battalion in France and England before returning to Australia in April 1919. He married Eve Hannah Hewitt in Adelaide in 1929 and was living at Glen Osmond at the foot of the Adelaide Hills at the time of his death in 1982. We believe he and Eve had two children; and 2) Joyce Rosalind White (1899-1988) who we don't think married. 1.1.2 Amy Caroline Wright (1866-67). 1.1.3 Charles Theodore Wright (1869-1923) who was born in Adelaide and educated at Prince Alfred College, married Mary Anita Bailey (1867-1946) at Port Adelaide in 1913. The South Australia index of bdms shows that Mary was born in the Daly RD of the state in 1867 (reg no 58/322). Her parents were said to be James Bailey and Mary Elizabeth Kenworthy. A death notice in the Adelaide Register informs us that Charles, who was a member of the superintendant of mails office at the Adelaide GPO, died of pneumonia at his residence, 'Girrahween' 11 Halsbury Ave Kingswood on 8 August 1923. Mary died in 1946 and was cremated in a private ceremony held at the West Terrace Crematorium. We don't know if she and Charles had any children. 1.1.4 George Henry Edward Wright who married Mary Dawson in Adelaide in 1892 and had two children we are aware of: Henry Adkisson Wright (1893-1903) and George Adkisson Wright who was born in Adelaide in 1902. Born at Staplehurst in Kent, Caroline was living with her parents in Clapham in Surrey in 1851. At the time of the 1861 and 1871 censuses she was working as a domestic servant for a William E. Hardy, a professor of mathematics and writing master, at 10 Stockwell Park Cresent in Lambeth in London. She was a witness at the respective weddings of her sister, Mary Ann, and brother, Charles Theodore Hickmott, at Clapham and Lambeth in 1862 and 1867. Following her father's death at Clapham in 1871, she sailed to Adelaide on the 1040-ton DAVID BRUCE to join her older sister, Mary Ann Wright, and her family there. She remained in Adelaide for the rest of her life, working for part of this time for a James Coombe of Glenelg, and died at her sister's Malvern residence on 21 September 1907. She did not marry and is buried in Adelaide's West Terrace Cemetery. 1.3 Theodore Charles Hickmott (1844-79). Also born at Staplehurst, Theodore married London-born Mary Anne Adams (1845-1903) at St Stephens Church of England in Lambeth on 1 January 1867. Both Theodore and his father were said to be milkmen, Mary's father was Thomas Adams a printer. The wedding, which took place after banns was witnessed by Thomas Adams and Caroline Hickmott. In 1871 Theodore (a 27 year-old cowkeeper) and Mary Anne were living at the Union Dairy in James Street in Clapham along their son Charles E. A. Hickmott (born at Clapham in 1868), Theodore's father Edward and two visitors: Thomas and Ann Adams (presumably Mary Ann's brother and sister-in-law). Theodore Charles died in 1879 and was buried at the South Metopolitan Cemetery. At the time of the 1881 census Mary Anne and her son Charles Edward were living at No 4 New Street in Newington in London. Also present was a visitor, Ann Hickmott, a 51 year-old widow who was born in Wallingford in Berkshire. Mary Anne and Charles Edward were back at Clapham in 1891. Ancestry's London marriages database shows that Mary Anne Hickmott, a widow of full age, married Walter Ambrose at St Marys Newington on 23 February 1896. The wedding was witnessed by Charles E. and Selina Ann Hickmott. The 1901 census has Mary Ann (51) and Walter (49 year-old yardman) living at 25 Frome Street in Islington. Although still to be confirmed, we think that mary Anne died there five years later. Theodore and Mary Anne's son, Charles Edward Adams Hickmott (1868-97) married Selina Ann Endersby (1869-1956) at Wandsworth in London on 7 December 1894. According to their wedding certificate, Charles was a 27 year-old bachelor and Selina a 25 year-old spinster, the daughter of the farmer William Endersby (deceased). The wedding was witnessed by James Thomas and Annie Endersby. According to the 'Endersby Family Tree' on Ancestry.com, Selina was born at Caxton in Cambridgeshire in 1869. Her parents were William Endersby and Sarah Ann Bradshaw who were married at Downham in Cambridgeshire in 1853 and had four children in addition to Selina: Josiah (1854-1916), Sarah, Tamar A. and James Thomas Endersby. At the time of the 1891 census, she was working as a parlour maid in Streatham in London. Charles Edward Adams Hickmott died at Balham in Wandsworth in 1897 and was buried at the South Metropolitan Cemetery. The 1901 census shows Selina (a 31 year-old widow and shirt machinist) and her son Theodore Hickmott (5, Balham Surrey) residing at 32 Fullerston Road in Wandsworth in London. Ancestry's London parishes database shows that Selina married John Henry Gilliam, a 53 year-old widower and sculptor, at Clapton on 5 November 1904. She was then living at 23 Victoria Road in Clapton. John, the son of Richard Gilliam, sculptor (deceased) resided at 70 Oval Road Croydon. The wedding was witnessed by Wallace and Elizabeth Martha Bream. The 1911 census has John Henry (60, Dorking Surrey) and Selina Ann Gilliam living at 70 Oval Road East Croydon. Also present were Theodore Hickmott (15 year-old carpenter's apprentice born at Walham in Surrey), Jack (5) and Kathleen Gilliam (2) both of whom were born at Croydon, and Arthur Gilliam (a 22 year-old marble polisher born at Wandsworth in Surrey). According to the Catherine House records, Selina died in the Surrey North Eastern RD in 1956. What of her and Charles' only son, Theodore Charles Endersby Hickmott The LDS database shows Theodore was baptised at Lutton St Nicholas in Lincolshire on 25 April 1895. The censuses show him living with his widowed mother, Selina Hickmott, in Wandsworth in London in 1901 and, in 1911, with his mother and step-father at East Croydon in London where Theodore was working as a carpenter's apprentice. Ancestry's British Army WWI Pension Records show that a Theodore Charles Hickmott, an 18 year-old cabinet maker born at Balham in Surrey, enlisted at Croydon on 7 September 1914 and was discharged as no longer fit for war service on 26 September 1917. He had served in the BEF in France from 27 July 1915 to 9 July 1916 (probably in the Royal Surrey Regiment although that has still to be confirmed). His NOK was his mother, Lena Gilliam of 65 Alexandra Road Addiscombe Croydon. Ancestry's BMDs for Surrey show that Theodore (31 year-old stock-keeper of The Exchange London Road in Thornton Heath) married Margaret Emma Usher (33 of 1 Eyland Rad in Croydon) at St John the Baptist Church in Croydon on 26 February 1927. Theodore's father was said to be Charles Edward Adams Hickmott, a deceased cashier, and Margaret's was Arthur Asher, removal foreman. The wedding was witnessed by Jack Lionel and Kathleen Maud Gilliam (Theodore's step brother and sister). Although still to be confirmed, we believe Margaret was born at Camden Town in London in 1893, the daughter of Arthur Usher and Mary Beauchamp. We do know that she died in the SurreyMidEastern RD of Surrey in 1943 and that Theodore re-married the following year - to a Kathleen M. Haslett. The London electoral rolls show a Theodore C. and Kathleen M. Hickmott living at 26 Taunton Close in Sutton North ward of London in 1964 and 1966. Theodore Charles Endersby Hickmott died in the Kingsclere RD of Hampshire in 1974 (6b, 1142). A Kathleen Mary Hickmott, born in around 1901, died in the Bromley RD of Kent in 1982. Theodore and Kathleen had a son, Michael T. Hickmott who was born in Surrey in 1946. We don't think he and Margaret had any children. The Lamberhurst parish records show that a Mary Hickmott gave birth to a first son, James Hickmott, at Lamberhurst in 1809 and a second son, Thomas Hickmott, at Lamberhurst in 1813. There was no indication of the father in either case. Although we have not been able to confirm this Mary is Thomas and Elizabeth's daughter, it does seem possible given the absence of any other obvious contenders and in light of the fact Mary doesn't seem to have married until 1814 (the registers show that a Mary Hickmott married George Wheeler, an agricultural labourer, at Lamberhurst on 2 June 1814). The 1841 census shows George (60) and Mary Wheeler (50) living at Windmill Field at Tunbridge Wells (next door to a James and Mary Goldsmith and their daughter). By the time of the 1851 census George had died. Mary, then a 56 year-old widow and laundress who was born at Lamberhurst,was still living at Tunbridge Wells with a 43 year-old lodger, Thomas White, from Wiltshire. The Catherine House Records show a Mary Ann Wheeler died in the Tonbridge district of Kent in the January quarter of 1854 (volume 2a, page 234). What of James and Thomas? It is possible, although not yet proven, that James emigrated to Australia. Marilyn Mason tells us that she descends from a James Hickmott who was born in Lamberhurst in around 1809 and married Sarah Clark(e) there in 1835 before, with their son Thomas, emigrating to Australia on the emigrant ship the MAITLAND (this sailed from Gravesend and arrived at Sydney Cove on 6 November 1838). Marilyn continues that because some of its passengers had scarlet and typhoid fever, the ship was immediately placed into quarantine at Spring Cove where it remained for a further 23 days. After their release, the family eventually moved to Portland Head and then to Sackville Reach on the Hawkesbury River where James worked as an agricultural labourer. While there they had two further children: Mary Ann (born in 1846) and James (1848). They later moved to Burrendong where James and Sarah died and were buried in 1881 and 1886 respectively (note that the Lamberhurst parish records contain no mention of James and Sarah's marriage although they do indicate that banns were issued for the marriage of a James Hickmott and Sarah Clifton (a widow) at Lamberhurst in 1838). William was born at Lamberhurst in 1796. He married Hannah Wingate at the All Saints Church at Maidstone (pictured on the left) on 15 March 1821. The LDS index shows that Hannah, the daughter of William and Mary Wingate, was baptised at Chatham in Kent on 25 December 1802. Her siblings may have included: Mary (baptised at Chatham in 1796), William (1798, Chatham), Richard (1800, Chatham), Hannah (1802, Chatham), Louisa (1806, Chatham), Benjamin James (1810, Chatham), John Morris (1810, Chatham), Mary Ann (1810, Chatham) and George Jonathon (1812, Chatham). The 1841 census shows William (a 46 year-old agricultural labourer) and Hannah Hickmott (39) at Plain Farm in Staplehurst in Kent (the farmer is William's older brother Edward Hickmott). Also present were six of William and Hannah's children: Charles (18), Harriet (12), William (8), Kerenhappuch (7), Alfred (4) and Hannah Hickmott (2). By the time of the 1851 census William (now a 55 year-old beer seller) and 'Annah (48) were living at 47 Upper Stone Street in Maidstone. Also present were four of their children - William (18, farm labourer), Karen-happuch (15), Alfred (14, butcher) and Hannah Hickmott (12) - as well as Hannah's brother Richard Wingate (a 50, farm labourer). Both William and Hannah died in Maidstone, he in 1860 and she the following year. Born in Lamberhurst in 1823 Charles married Maidstone-born Hannah Lawrence Jupe (1828-1906) in Maidstone in 1846. Their wedding certificate contained on the Genaelogist website shows that Hannah's father was Thomas Jupe, a paper maker. Charles' father was William Hickmott, victualler. The wedding was witnessed by Jesse Beecher and Harriet Hickmott (Charles' sister, she and Jesse were married later the same month - see below). In his family tree on the MyTree.com website, Maxwell Coughlan states that Hannah's parents were Thomas deJupe and Hannah Lawrence. He further says that the de Jupes were originally French Huguenots (and silk weavers and paper makers) who came to England from La Rochelle in France sometime between 1625 and 1650. Charles Thomas and Hannah had at least six children: Charles William (born in 1847), Hannah Lydia (1849), Annie (1851), Elizabeth Emma (1859), Laura Lily (1864) and Alice Maud (1864) where all were born in Maidstone. Like Charles' parents, Charles Thomas and Hannah Lawrence Hickmott lived most of their lives in Maidstone, Charles dying there in 1885 and Hannah in 1906. We know from the various censuses that Charles worked first as an agricultural labourer and then as a 'beer retailer' and publican in Maidstone. The 1861 census has him living at 5 Waterloo Lane in Maidstone with his wife Hannah (who was said to be a worker at the paper mill), son Charles and daughters Hannah, Ann and Elizabeth. In later years he and Hannah and their family resided at their Maidstone pub, 'The Hammer in Hand'. In 1870 the couple celebrated the wedding, in Maidstone, of their eldest son Charles William Hickmott to Anne Gammon. Anne worked at the local paper works and was the daughter of John Gammon a former soldier. She had been born in India while John was serving there in the British Army (to distinguish her from Indian nationals her name was consequently annotated in the English censuses with the words 'British Subject'). At the time of his marriage Charles William was working as an attendant at the Kent County Lunatic Asylum at Maidstone. A few years later Charles and Hannah's eldest daughter Hannah Lydia Hickmott married George Weeden (a paper maker who came from Loose in Kent). The 1881 census shows both new families living in Maidstone. By this stage Hannah and George had three children: Beatrice, Frederick and Alfred. Charles William and Anne had five daughters: Lilly, Bertha, Grace, Annie, Laura and Alice. The number of Charles and Hannah's grandchildren was growing quickly. Charles Thomas Hickmott died at Maidstone on 20 January 1885. His widow Hannah lived initially on Upper Stone Street in Maidstone with two of her unmarried daughters, Elizabeth and Laura (then working as a dress maker). By the turn of the century Hannah, aged 73 and living on her own means, was at 12 Havock Lane in Maidstone. This was the home of her son-in-law Philip Lewis (who was born at Lylbury in Shropshire) and had married Laura Lilian Hickmott in the late 1880s. Also present was another of Hannah's daughters, Elizabeth E. Hickmott, who was then 42 years old and also living on her own means. Charles and Hannah's oldest daughter Annie Hickmott had, during this time, married an Irishman, Job Mason, and seems to have gone to live in Ireland (where their daughter Keziah Mason was born in 1884). In 1901 Hannah's daughter Hannah Lydia Weeden was living at 96 Union Street Maidstone with her husband George and two sons Ernest (a paper maker), and Clifton (apprentice paper maker). Her eldest son, Charles William Hickmott, was dead and his widowed wife, Ann, was now the head of the household at 175 Boxley Road Maidstone. With her were eight of her children: Lily (a paper maker at Springfield Mill), Grace (dressmaker), Laura (a paper hand at Springfield Mill), Annie (23, dressmaker), Alice (20, paper hand Springfield Mill), Maria (an upholsterer's apprentice), Albert (an invalid) and Mabel (a scholar). Harriet was born at Chatham in Kent in around 1829. She married Jesse Beecher at Maidstone in November 1846. The 1851 census shows Jesse (a 26 year-old wheelwright journeyman) living on Pizen Well Road in Wateringbury (near Yalding) in Kent with Harriet (23 and born at Chatham) and their three children: Jesse (3), Theodore (2) and Emily (1). According to one of their great grandsons, Fred Beecher, Jesse and his eldest son Jesse W. emigrated to New York in the United States in November 1857. Harriet and their surviving six children followed them out in June 1859. The family lived at Sherman, Chatuaqua County in New York where they had three more children: Henry Ward, Richard Edwin and Mary Hannah ('Molly') Beecher. Fred continues that 'Jesse Beecher died on 24 April 1865 of typhoid fever in Wilmington North Carolina. He was at the time a private soldier in the Union Army. Harriet Hannah remarried in around 1870. She died at Neodesha, Wilson County in Kansas sometime after 1875'. He adds that Harriet's second husband was C. S. Bradburn who was born in Canada in 1833. 'When she married him the US Government took away her widow's pension, including her farm'. Details of Jesse and Harriet's family can be obtained from the Rootsweb sites maintained by Fred Beecher ('fbeecher' last updated 1 November 2001) and Allen Hume ('Allen Hume's Reunion File' last updated 1 Mar 2005). Born at Chatham in Kent, William seems to have been twice married, first to Elizabeth Ann Neave in 1873 and, second, to Emma Eliza Evans (1857-1927) in around 1885 (we have yet to find a record of his second marriage). The 1871 census has a William Richard Hickmott (38 year-old dealer in wood and coal who was born at Chatham) living in Hervey Town in Tunbridge Wells with his wife Eliza Ann (41, Frant). The 1881 census has a William R. Hickmott, 48 year-old married foreman on a coal wharfe, lodging with the Turner family at Ashford in Kent (we think that William's wife may have died in 1876 although that has still to be confirmed). The 1891 census shows William (a 58 year-old contractor's labourer) and his wife Emma E. Hickmott (33, Ashford) living on West Lane on the Isle of Grain in Kent. With them were their three children: Alice (4, Maidstone), Phillis (2, Maidstone) and William Hickmott (6m, Grain). The 'Smith Family Tree' on Ancestry tells us that William and Emma Eliza and their first three children emigrated to the United States in around 1892, the year their second son, Robert Stewart Hickmott, was born in Kansas. The 1900 US census shows William R. 'Hickmuth' (68 and born in England) living at Twin Groves, Severy City in Greenwood County in Kansas. With him were his wife Emma E. (43, England) and seven children: Alice (14, England), Phillis (12, England), William R. (10, England), Stewart (8, Kansas), Alfred E. (5, Kansas), Edward E. (5, Kansas) and Grace H. Hickmott (1, Kansas). William snr died and was buried in Amarillo in Potter County, Texas in 1908. The 1910 US census shows Emma still living in Amarillo. With her were three sons and a daughter - William R (19, England), Alfred E. (14, Kansas), Edward E. (14, Kansas) and Grace H. Hickmott (10, Kansas) - and a 'roomer', William L. Rohner (21, Ohio). Emma died at Amarillo on 31 July 1927. The 'Find A Grave' website informs us she was then Emma Eliza Brown, had been born in England on 9 July 1857 and was the daughter of William Evans. The LDS database shows an Emma E. Brown (62, England) and husband Charles H. Brown (62, Pennsylvania) were living in Denver Colorado in 1920. 3.3.1 Grace Hazel Hickmott (1899-prob1979). The 'Smith Family Tree' on Ancestry tells us that Grace married Reginald James Clark (1898-1964) and had three children. The LDS database shows a R. J. Clark (49, Missouri), Grace Clark (42, Kansas) and Eldon Clark (19, Kansas) living in Newton City, Harvey County in Kansas in 1940, and a Grace Hazel Clark, born in Kansas on 5 October 1899, died at Contra Costa in Califoria on 1 April 1979. 3.3.2) Alfred Emmett Hickmott (1895-1983). The 'Smith Family Tree' on Ancestry tells us that Alfred married Nora Lee Sherrod (1904-85) and had at least one child. The LDS database shows that A. E. Hickmott and Nora Lee Sherrod had a daughter, Delmos Lee Hickmott, at Potter in Texas on 16 March 1934; and that Alfred (34, Kansas), Nora (25, Arkansas) and Nora's sister, Ora Sherrod (25, Arkansas) were living at Amarillo, Pottercounty Texas in 1930. At the time of the 1940 census the first three were in Santa Fe in New Mexico. 5) Thelma Alice Hickmott who we think married Paul Jordan Hanson although that has still to be confirmed. All taken from the 'Smith Family Tree' on Ancestry.com, the photos above are of Alfred and Edward William Hickmott during the Second World War. The one below is said to be 'a Hickmott family gathering'. While there is no indication of when it was taken or who are pictured, it is presumably of Shirley May Hickmott nee Edwards and her family. Alfred was born at Staplehurst in 1836. The 1861 census shows him working as a tea dealer and book seller and living at Mill Street in Maidstone with his wife Elizabeth (29) and children Henry (2), Albert (1) and Alfred (2m). Elizabeth and the boys were all born at Maidstone. A draper in 1871, Alfred later worked as a bookseller and credit dealer before becoming an 'election agent' sometime before the 1891 census. He and Elizabeth continued to live in Maidstone and eventually had nine children there, in addition to those earlier mentioned: Arthur (born in 1862), Edwin (1863), Lydia (1866), William T. (1867), Elizabeth (1869) and Joseph (1872). All the children were born at Maidstone except Elizabeth who was born at Seal, in Kent. John Hickmott was born in Lamberhurst in 1797 and married Patience Price at Staplehurst in 1819. Both were said in the parish registers to be 'of this parish'. The marriage was witnessed by Harriet Hickmott (most likely his sister although it could also have been the wife of his younger brother Samuel, Harriet Hartridge, who married Samuel in Staplehurst earlier in the same year). Jim Baker, from Michigan in the United States, tells us that Patience had at least two brothers: Isaac and Joseph Price. 'Isaac's family moved to the Dunkirk area of Kent, and ... Joseph moved to the Eynsford area'. Details of the Price families are contained on his Rootsweb site The Ancestors and Family of William Bernard Robinson (12 November 2006). The 1841 census has a John Hickmott, aged 50 and born in Kent, in the 'General Penitentiary' in Westminster in Middlesex. Another John Hickmott, a 42 year-old agricultural labourer, was working on Bletchenden Farm at Headcorn. It seems that John died sometime before 1851 for the census for that year shows Patience (a 54 year-old widow who was born at Marden) living in the Frith Building at Eltham in Kent. Also present were Charlotte (28), Henry (26, labourer) and Caroline (24) where all the children had been born at Lamberhurst. The London parishes database on Ancestry.com shows that a 'Patient' Hickmott, widower and daughter of Peter Price, labourer, married John Parnell, son of John Parnell labourer, at Lewisham on 25 November 1855. The marriage was witnessed by her son-in-law Mark Evenden and Carlien (probably Caroline) White (Patience's married daughter). The 1861 census has a John and Patience Parcell living in Lee in Kent although their ages - 46 and 36 - are too young for our couple. The Catherine House index shows that a 'Patient Purcell', born in around 1798, died in the Lewisham RD of London in 1866. John and Patience had four children we know of: Ann, born at Marden in around 1819, Charlotte (1821, Lamberhurst), Henry (1825, Lamberhurst) and Caroline Hickmott (1827, Lamberhurst). It seems that all four spent time in the Lamberhurst Poor House during the first half of the 1830s. According to Dawn Miles, the records maintained by the institution note, on 23 June 1834, that 'Ann Hickmott: Lives with Mrs Wickenden at Hog Hole since May 29th 1833. Wants clothing, a change of pair of shoes, 1 upper petticoat, 2 aprons and 2 pr stockings and 1 pr stays'. They further record that Henry and Caroline were discharged from the Poor House on 22 May 1834 with the notation 'Gone to reside with his/her parents'. Charlotte remained in the Poor House until at least October 1835. She was back with her family by the time of the 1851 census which has the by-then widowed Patience and her three youngest children all living together in Elham in Kent. We haven't been able to trace Henry after that. Nor do we know with any certainty what happened to John and Patience's eldest daughter Ann. We know that Caroline married Joseph White (1827-91) in the Bromley RD of Kent in 1851, had no children and lived all her married life in Lee in Kent (although still to be confirmed we think she died there in 1899. Her husband Joseph died there in 1891). Pam Kemp, who is one of their descendants, informs us that John and Patience's second daughter, Charlotte, married Mark James Evenden (1827-76), the son of the farmer John Evenden, at East Farleigh in Kent in 1852. The wedding was witnessed by Thomas Evenden and Caroline White (Charlotte's sister). The couple lived at East Farleigh after their marriage and had two children there: Harriet Elizabeth (born in 1856) and John Joseph Evenden (1860). The 1861 census shows Mark (33) and Charlotte (38) living on Dean Street in East Farleigh with their two children and eight year-old niece, Jane Elizabeth Evenden. In 1871 Mark (45 year-old carman) and Charlotte (48) and their eleven year-old son John were at 35 Quere Street in Lee in Kent (Harriet was working as a under house maid for master mariner, Henry Vance and his wife Mary Ann, at Lewisham in London). By the time of the 1881 census Mark had died and the widowed Charlotte (58) was working as a laundress and living on Dean Street in Lewisham with her son John (a 21 year-old gardener), married daughter Harriet Darby (a 24 year-old laundress) and grandson, William Darby (8m, Lee). The Catherine House records show that Charlotte died shortly after the census was taken. What of her and Mark's two children? 1) William James Darby (1880-1961) married Julia Maria Wood (1878-1955), daughter of the deceased bootmaker, John William Wood, at St Nicholas Deptford in London in 1904. The London electoral rolls show they lived all their married lives in Lewisham in London, Julia dying there in 1955 and William six years later. They had three children we know of: 1) Pam Kemp's father, William Tom Darby (1909-67) who married Ivy Lucy Margaret Godsmark (1907-76), daughter of Percy Merrick and Elizabeth Godsmark nee Elsden, in the Lewisham RD of London in 1933; 2) Frederick George Darby who was born in the Greenwich registration district of Kent in 1910; and 3) Albert James Darby (1916-91) who, according to the 'Darby/Russell Family Tree' on Ancestry, married Eileen Vaughan in 1940 and had three children: Gwendoline, Ronald and Lyn Darby. 2) Thomas Frederick Darby (1885-1969) who married Sarah Agnes Pollington, daughter of William Pollington and Sarah Breedon, at the Church of St Mary Magdalen in Bermondsey in London in 1914. We think they had three children: William, Ronald and Douglas Darby. 4.1.2 John Joseph Evenden (1860-1928) married Margaret Druscilla/Druscella Sadler (1861-1943), the daughter of George Sadler, a labourer from Hallingbury in Essex, at Bermondsey in London in 1885. Margaret and John, who variously worked as a gardener, fishmonger and bricklayer, lived at 31 Cadbury Road Bermondsey after their marriage and had six children we know of there: Charlotte Druscella (1887), Julia Maud (1888), Margaret May (1892), John Joseph Hickmott (1894), Percy Frederick (1896) and Alice Daisy Evenden (1900). John died at Bermondsey in 1928, Margaret, who, with their eldest daughter Charlotte, continued to live at 31 Cadbury Road after John's death, died in Surrey in 1943. 1) Julia Maud Evenden married Joseph George Eaton, son of Patrick Eaton and Rebecca Brent, at Bermondsey in 1912. We don't know if they had any children. 2) Margaret May Evenden married a local man, Oliver James Whitcombe (1882-1964), at Bermondsey in 1918. The London electoral rolls show they lived in the London borough of Southwark in the 1920 and 1930 before moving to 19 Elrington Road in Hackney where Oliver died in 1964. The 1965 roll has Margaret and her daughter Olive M. Whitcombe living at 53 Russell Square in Camden in London (suggesting that Olive did not marry although this has still to be confirmed. We think that Magaret and Oliver's only son, Stanley James Whitcombe, married Alice May Munton in the Islington RD of London in 1949 and had a son three years later. 3) John Joseph Hickmott Evenden (1894-1949) seems to have been twice married, first to Rose Jane Allen (1892-1930) in Bermondsey in 1915 - the Catherine House index indicates they may have had a son, John Charles Evenden (1917-2001), although that has not yet been confirmed - and second, to Annie Florence Maud Robson (1895-1963) in Cheshire in 1940. We don't think John and Annie had any children. 4) Percy Frederick Evenden married Rose Eliza Webb in Bermondsey in 1921 and lived in Bermondsey and Hackney after their marriage. The Catherine House index indicates they may have had two boys - Albert and Ronald Evenden - although that has still to be confirmed. 5) Alice Daisy Evenden (1900-80) married Charles Clarence Carne (1893-1976), son of Charles Philip and Frances Margaret Carne nee Torkington, in the St Olave RD of London in 1923. We don't know if they had any children. The UK Outward Passenger Lists on Ancestry show that an Alice D. and Charles C. Carne, who was a painter, travelled from Southampton to England on the M V FIRSEA on 26 February 1958. Their destination was Melbourne, and UK address was 55 Lodge Road Croydon in Surrey. They lived for two years in Australia before returning to England on the ORION, arriving at Southampton on 22 April 1960 (their intended address in England was 43 Flemington Road Walthamstow E.17). It seems that they both returned to Melbourne where Charles died in the suburb of Box Hill in 1976 and Alice in adjoining MacCleod in 1980. We don't know if they had any children. Elizabeth Hickmott was born in Lamberhurst in 1801. The local parish records shows that an Elizabeth Hickmott had three illegitimate children baptised at Lamberhurst: Harriet Hickmott (baptised on 28 January 1821), Charlotte Rummens Hickmott (25 April 1824) and Charles Thorn Hickmott (30 March 1828). Although we cannot be entirely certain this is our Elizabeth, we think it likely given the absence of any other real alternatives. The same records show that an Elizabeth Hickmott married Samuel Gates at Lamberhurst on 1 October 1832. The LDS data base shows that Samuel and Elizabeth lived at Appledore in Kent after their marriage and had four children baptised there: Mary Ann (baptised on 19 February 1833), Claudius (24 February 1833), Sophia (18 January 1835) and Esther Gates (31 May 1837). They may also have had a son, William Gates, baptised at Chatham in Kent on 5 October 1839. 5.1 Charlotte Rummens Hickmott (1824-1901). The local parish records show that Charlotte was baptised at Lamberhurst on 25 April 1824. The LDS database has a 15 year-old Charlotte 'Hicknott living at St James Clerkenwell in Middlesex at the time of the 1841 census (I haven't been able to confirm this on Ancestry). Carolyn Fenwick thinks that Charlotte married George Powderham (1818-60) in the Elham RD of Kent in 1844. She continues that 'Charlotte consistently stated she was born in 1824 in Lamberhurst. This, as far as I am concerned, makes her Charlotte Rummens Hickmott, daughter of Elizabeth Hickmott ... [who is probably] daughter of Thomas Hickmott and Elizabeth Wibley ... After the death of George in 1860, Charlotte had an illegitimate child and then re-married ... I have her marriage certificate - she claims that her father was Samuel Hickmott, a labourer'. If that was the case there seem to be three possible candidates: 1) Elizabeth's older brother who was born at Lamberhurst in 1799 but was married and had two children by 1824; 2) the son of Nathaniel Hickmott and Patience Price who was born at Lamberhurst in 1803 and married Elizabeth Egersdorf in Shoreditch in London in 1824; and 3) the son of John Hickmott and Mary Selves who was born at Marden in 1781. If her father was Samuel Hickmott then I think it likely he was the second of these. Two further explanations are that Charlotte was talking about her step-father, Samuel Gates, or her father was actually a Rummens and not a Hickmott at all (a number of Rummens families were living at Lamberhurst around the time of her birth). The 1851 census shows George, 32 and born in Hampshire, and Charlotte Powderham (27, Lamberhurst) living at Shoreditch in London with their three children: Charlotte (6, Suffolk), Esther (4, Rutlandshire) and Mary A. (1, Islington). George died in 1860 and the widowed Charlotte re-married in 1866. Ancestry's London marriages database shows her second spouse was George Hibberd who she married in the Christchurch parish church at Hoxton St John in London on 21 May 1866. George, a widower, was a bricklayer by trade, the son of James Hibbard, also a bricklayer. Charlotte's father was said on their wedding certificate to be Samuel Hickmott, a labourer. The 1871 census shows George, 47 year-old bricklayer born at Salisbury in Wiltshire, and Charlotte Hibberd (47, Lamberhurst) living in Battersea in Surrey with Alfred Powderham (16, Shoreditch), Edward Powderham (13, Lambeth), Joseph Powderham (8, Lambeth), Adolphus Hibberd (12, Chelsea Middlesex), James Hibberd (3, Lambeth, Surrey) and Septimus Hibberd (1, Battersea). The 1881 census has George (67) and Charlotte (67) living by themselves on New Road in Clapham in London. James was baptised at the St Barnabas parish church at Kennington on 18 August 1867 and was living with his parents at Battersea at the time of the 1871 and 1881 censuses. Ancestry's London marriages database shows that he married Emma Agnes Henrick, the 19 year-old daughter of James Henrick (deceased), at St Barnabas on 6 January 1889. Emma was living at 18 Neptune Street while James, then a 21 year-old labourer, was at 6 Neptune Street. His father was said to be George Hibberd, a bricklayer. The wedding was witnessed by a W. and M. Whaley. The 1891 census has James W. Hibberd, a 23 year-old engineer's labourer, and his wife Emma A. (20 and born at Lambeth) living on Etruria Street in Battersea with their two children: James A. (2) and Emma A. Hibberd (3m) both of whom were born at Battersea. In 1901 the four of them were registered as living at 2 John Street in Battersea where James was working as a paperhanger. According to the 'Hart Family Tree' on Ancestry, Emma's parents were James Godfrey Henrick (1839-85) and Elizabeth Annie Gardner who were married at Westminster St Margaret in 1864. It adds that Emma and James (John) William Hibberd had eight children altogether: James A., Emma A., George Henry (1893-1966), James, Daisy, Florence J. and William Hibberd, and Emma, who died in 1904, was married twice, her second husband being Robert George Hortin (1870-1939). Born at Battersea, Septimus married a widow, Mary Ann Lee, in the Wandsworth RD of London in 1903. The 1911 census has Septimus, 44 year-old jobbing hand, and Mary Ann Hibberd (48 and born at Lambeth) living in East Battersea with five children: George Lee (19, Lambeth), Florence Lee (17, Lambeth), Daisy Lee (14, Lambeth), Violet Lee (11, Battersea) and Hilda Hibberd (6, Battersea). The 1914 electoral roll for the Lambeth electorate shows Septimus living at 104 Crimsworth Road in Kennington. Between 1925 and 1929 he and Mary Ann were registered as living at 2 Milton Place in Kennington along with a George Lee and, in 1925, 1926 and 1927, a Thomas William Ford. The Catherine House index indicates that Septimus died in the Lambeth RD of London in 1929. He and Mary Ann seem to have had only one child: Hilda May Hibberd (1904-97) who was born at Battersea and married Thomas William Ford in the Lambeth RD of London in 1924. Hilda died there in 1997. We don't know if she and Thomas had any children. Charles was born in Lamberhurst in 1802 and married Eliza Rochester from Rotherfield at Lamberhurst on 27 August 1827. The birth places of their children show that they lived initially at Lamberhurst before moving to Brenchley in around 1840. The couple had at least six children: George Hickmott (born in 1831) who we think married Mary Ann Butcher in 1852; John Hickmott (1833), Frances Hickmott (1836), Mary Ann Hickmott (1838), Sophia Hickmott (1841) who, as described below, married William Pearman; and Elizabeth Hickmott (1843). Born at Brenchley in 1841, Sophia lived initially with her parents before working as a servant in Tunbridge Wells. On 19 July 1865, she married William Pearman at the St Mary's parish church at Romney Marsh in Kent. According to her great, great granddaughter, Vyv Mathews, William was born at Brockhurst in Hampshire, the son of William Pearman (1796-1857) and Hannah Hollow (1796-1855). He joined the Royal Navy in 1856 (where he served for a time on the frigate HMS Ariadne) and transferred to the Coast Guard in 1864. After their marriage William and Sophia lived initially at the Coast Guard station at Folkestone where their first two children, William Charles and Alfred Ernest Pearman were born. William left the Coastguard sometime between 1871 and 1881 to become a green grocer. In 1881 he and Sophia were living at 29 Saxton Steret in New Brompton in Kent with four of their children: Emily Elizabeth, George Henry, John F. and Frederick James Pearman where all were born at New Brompton. The couple's two eldest boys, William and Alfred, were at school in Greenwhich. The 1891 census has the family at 'Hampshire House' on Gillingham Road in Gillingham in Kent. William and Sophia were still there in 1901 with three of their unmarried children - Frederick, Arthur Ernest and Florence Alice Pearman - and their married daughter Emily Elizabeth Avent and her son James George. Sophia Pearman nee Hickmott died at Gillingham in 1907. The 1911 census has William, a 76 year-old widower and Navy pensioner, still living at 75 Gillingham Road. Also there were his son William Charles Pearman (a 44 year-old Navy pensioner born at Dover), his married daughter Emily Eliza Avent (39) and her 14 year-old son James George Avent, and his seven year-old niece Doris Vera Drew (who was born at Luton). William died at Gillingham on 22 December 1922. Born at Dover in 1867, William was with his parents at Folkestone in 1871 and at school in Greenwhich in 1881. I couldn't find him in 1891. The 1901 census shows William, aged 33 and single, as a Petty Officer First Class on HMS TYNE stationed at Malta. 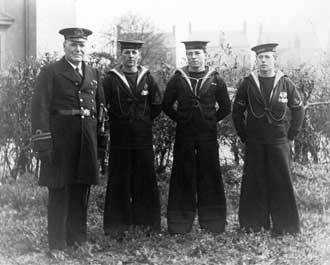 By the time of the 1911 census, he had retired from the Navy and was living as a naval pensioner with his father on Gillingham Road. The following year he married a Gillingham-born spinster, Alice Jane Beard (1866-1927), and was living at 14 Seaview Road in Gillingham at the time of his death, in the Royal Naval Hospital at Chatham, on 5 August 1931 (the UK National Probate Calendar shows probate was granted to a William Davis Newsome, draughtsman). William's wife, Alice, had pre-deceased him by four years. She and William had no children. Born at Dover in around 1870, Alfred was with his parents at Folkestone in 1871 and at school in Greenwhich in 1881. His great granddaughter, Vyv Mathews, tells us that Alfred served in the Royal Navy between 11 May 1885 and January 1922 when 'he was placed on the retired list as medically unfit', and in HM Coastguard from 1894. The Catherine House records show that Alfred Ernest Pearman and Minnie Louise Parker, from Chatham in Kent, were married in the Medway district of Kent in the October quarter of 1894 (vol 2a, page 1023). While I could not find him in the 1891 census, the 1901 census shows Alfred (a 33 year-old boatman for HM Coastguard) living at 2 Coastguard Cottage at Westgate-on-Sea in Kent. Also present were his wife Minnie and their three children: Ernest, Bertie and Mabel Pearman. Ernest and Bertie were born at Reculver in Kent while Mabel was born at Westgate in Suffolk. The 1911 census shows Minnie (aged 38 and born at Chatham) living at 1 Coast Guard Station at St Margaret's at Cliffe in Kent. Also present were four children: Ernest (14), Mabel (11), Ada (9) and Stanley (8). 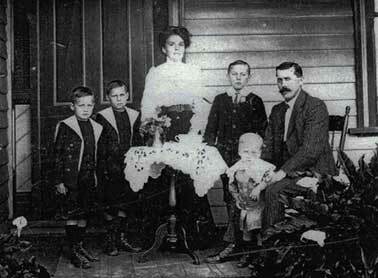 The census indicated Alfred and Minnie had been married 15 years and had five children all living. The photo on the left shows Alfred and his three sons, from left to right, Bertie, Stanley and Ernest Pearman. Alfred died in the Royal Naval Hopital at Gillingham in Kent on 5 December 1955. Probate from his will was granted to his wife Minnie who died at Gillingham five years later (probate from her will went to their son Bertie John Pearman, labourer). According to Vyv Mathews, Alfred and Minnie had five children in all: 1) Ernest William Pearman (1897-1961) who married Lilian Tucker and had three children: Joyce, Roy and Eileen Pearman; 2) Bertie John Pearman (1898-1985) who married Amelia Bertha Tucker (1896-1973) at Gillingham in Kent in 1920 and had two children: Ivy and Frederick Pearman; 3) Mabel Alice Pearman (1900-80) who married Horace Goodchild (1898-1985) at Strood in Kent in 1924 and had three children: Vera Gwendoline, Leonard Extol and Kenneth Raymond Goodchild; 4) Ada Florence Pearman (1901-94) who married Charles Edward Smith at Strood in 1925 and had five children: Alan, Bernard, Colin, Dulcie and Elaine Smith; and 5) Stanley George Pearman (1902-84) who married a South African, Ada Aleta Cordy (1902-77), and had one daughter: Florence may Pearman (1927-79). Born in Dover in 1871, Emily was with her parents in 1881. The Catherine House records show she married James George Avent in the Medway district of Kent in the July quarter of 1895 (vol. 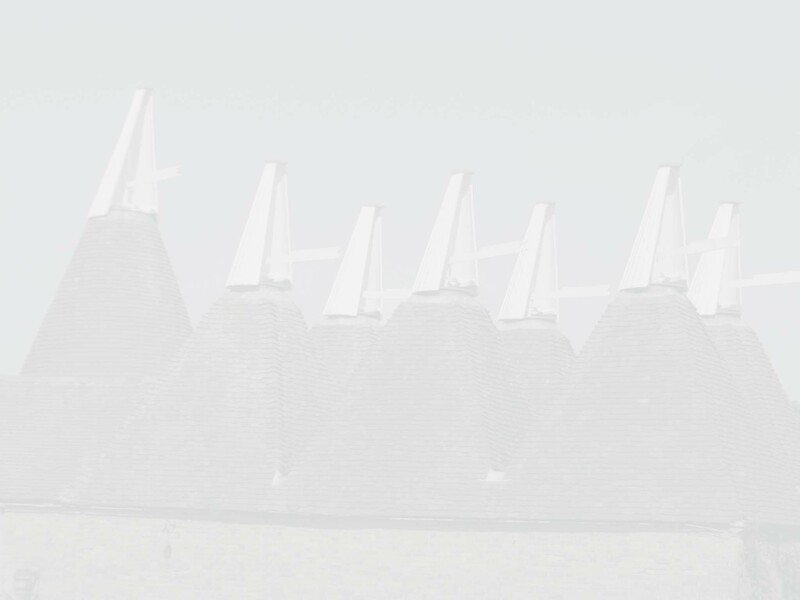 2a, page 1060). At the time of the 1901 census she and her son James G. Avent (4) were at the house of Emily's parents in Gillingham. Born in New Brompton in Kent in 1875, George married Rose Mary Beard (1875-1960) - the sister of Alice jane Beard - in the Medway district of Kent in the January quarter of 1898 (vol 2a, page 786). The 1901 census has George (a 26 year-old greengrocer) living at 65 Duncan Road Gillingham with his wife Rose M. (26 and born at Gillingham), daughters Winifred M (2, Gillingham) and Mabel F. (1, Gillingham) and George's single sister-in-law Eliza Beard (28, Gillingham). George died in Gillingham in 1909. The 1911 census has the widowed Rose, a 36 year-old greengrocer, still living on Duncan Road in Gillingham together with her sister Elizabeth Beard (38) and Rose's two girls: Winifred May (12) and Mabel Florence Pearman (11). All were born at Gillingham. Vyv Mathews tells us that Rose Pearman nee Beard died in Strood in 1960. Her eldest daughter, Winifred May Pearman (1898-1966) married Herbert harold Campaign (1894-1977) at Gillingham in 1919. Her younger sister, Mabel Florence Pearman, married Cyril John Eustace Chapman at Gillingham in 1921. Born in New Brompton in 1883, Arthur was with his parents in 1891 and 1901. According to Vyv Mathews, , he married Daisy Hockley and had seven children: Arthur E. (1913-1979), George W., Leonard E., Leslie, Joyce B., Ronald E. and Daisy. The Catherine House Records show a Daisy Knight Hockley was married in the Medway district of Kent in the July quarter of 1906 (vol. 2a, page 1476). Amber Heath nee Pearman, tells us that Fred, who was born at New Brompton in Kent, married Estella Margaret Alice Elvin (1883-1919) at the Church of St Barnabas in Gillingham in Kent on 26 December 1901. The couple's wedding certificate indicates that Fred (and his father) were printers by trade and that the marriage was witnessed by his younger sister, Florence Pearman. A copy of the wedding certificate plus details of Fred and Estella's family can be viewed on the Heath Family Tree located on the Ancestry website. According to this Estella was born at Lowestoft in Suffolk in 1883, the second daughter of George William Elvin (1845-1904) and Elizabeth Mary Ann Boyce (1857-1908). 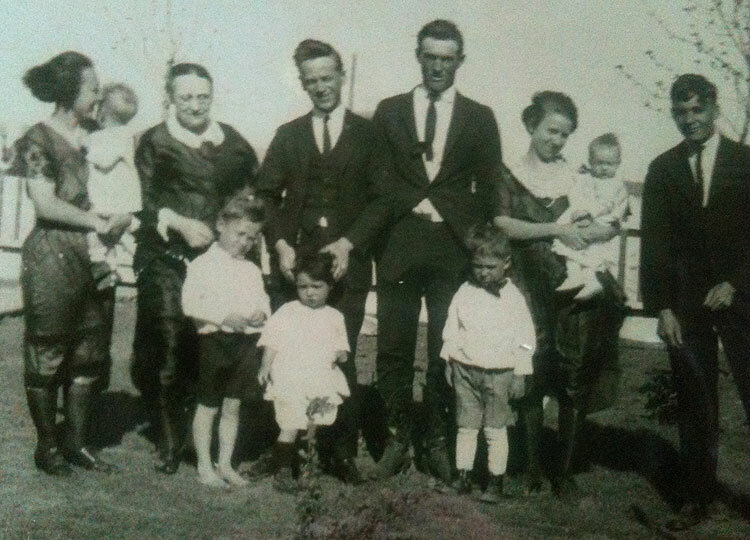 Amber continues that Fred and Estella and their three sons - Frederick Elvin William (1902-76), Ivan Arthur (1904-66) and George Alfred Pearman (1906-81) - emigrated to Western Australia on the SS Otway which sailed from London on 14 October 1910. They lived at East Guldford in Perth where they had three more boys: Maurice Charles (1911-1920), Horace James (1915-1951) and Vernon Stewart Otway Pearman (1919- ). The photo on the left shows the family outside their home at East Guildford in 1914 (from L-R: George, Ivan, Estella, Frederick Jr and Frederick Sr holding Maurice). A year after this photo was taken, Frederick, like so many others who had come from England, enlisted in the 1st AIF. His records in the Australian National Archives show he was then working as a boiler maker's assistant, enlisted on 4 February 1916, and was allocated to the Australian Army Medical Corps (AAMC) Reinforcements. He departed Fremantle on the HMAT A8 Argyllshire on 9 November 1916 and arrived at Devonport in England on 10 January 1917. He was posted to the 3rd Australian General Hospital in Brighton where, six months later, he was diagnosed with serious heart disease and invalided out of the Army. He returned to Australia on the Hospital Ship Karoola on 3 July 1917 and died in the 8th Australian General Hospital in Fremantle on 26 February 1919. Amber tells us that sadly, Fred's wife Estella died later the same year from Spanish influenza and their young son Maurice died in 1920 from Enteric/Typhoid Fever. The three are buried together in Perth's Karrakatta Cemetery (Anglican Area, Section HA, Gravesite 0521). What of their other sons? 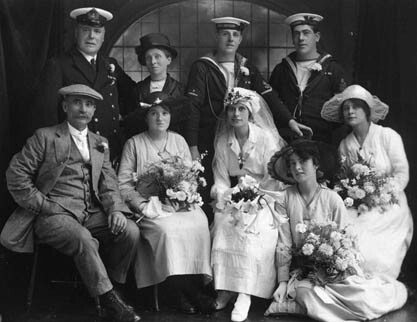 The WA Reverse Marriages Index shows their eldest boy, Frederick Elvin William Pearman, married Kathleen Winifred Beach (1907-84) in Perth in 1933. Amber Heath's website tells us that Kathleen came from Middlesex in England, the second child of Alfred John Beach (1873-1917) and Lydia East (1875-1941), and that she and Frederick had two children: 1) Joan Lydia Estella Pearman, who was born in Perth in 1934, married Donald Langlands there in 1956 and has three children - Gary, Jennifer and Phillip Langlands - and at least two grandchildren. 2) Graeme Ivan Elvin Pearman who was born in Perth in 1941, married Irene Metropolis there in 1964 and has two children - Mark and Andrea Pearman - and at least two grandchildren. The second of their England-born sons, Ivan Arthur Pearman (1904-66), married Gwyneth Bishop (c1913-2004) and had two children: Rosemary and John Pearman. Frederick and Estella's third England-born son, George Alfred Pearman (1906-81), married Matilda Maud Holley Gay (1907-89) at Fremantle in 1926 and had two children there before moving to Victoria where, according to the Department of Veterans Affairs' WW2 Nominal Roll, George enlisted in the RAAF at Laverton on 22 September 1936. He served in the Air Force until August 1959 by which time he had risen to the rank of Squadron Leader and was working in HQ MC Melbourne. The Australian Electoral Rolls show that George and Tillie lived the remainder of their lives in Melbourne - in the suburbs of Newport and Williamstown - he dying there in 1981 and she in 1988. 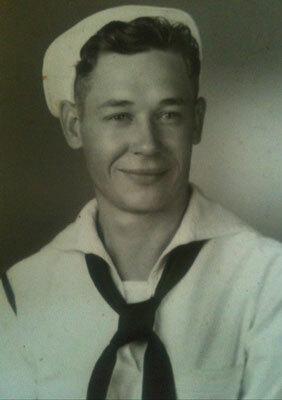 Their great granddaughter, Amber Heath, tells us they had two children: 1) Frederick John Pearman (1927-53). Born at Fremantle, Fred moved with his parents to Melbourne where he enlisted in the Australian Army at Royal Park on 13 March 1945. He was discharged on 8 January 1946 while serving in the 37 Australian Infantry Training Battalion. 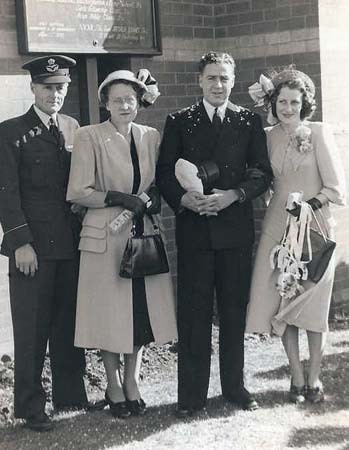 He married Melbourne-born Joan Susan Machar (1926-2013) in 1948 and had three sons - Robert, Daron Leigh and Max Pearman - before being tragically killed in a bus accident in 1953. Joan re-married - to William Sturdy - in 1956 and died in Altona Meadows in 2013. Her death notice, published in the Herald Sun on 29 April 2013, indicates that all of her and Fred's children were married and, at the time of her death, she and Fred had eight grandchildren and six great grandchildren. 2) Norma Lucretia Pearman who was born at East Fremantle in 1932 and married Alfred Adam Woods in Melbourne in 1951. The Australian Electoral Rolls show that they lived on Woods Street in the Melbourne suburb of Newport, where Alfred worked as a fitter, until at least the early 1980s. She and Alfred had three children: Linda Gay, Frederick James and William Woods. Born in the Perth suburb of East Guildford in 1915, Horace ('Horrie') James Pearman (1915-51) married Violet Hilda Dixon (1918-86) in Perth in 1940. The Department of Vaterans Affairs' Nominal Roll for WW2 shows Horrie enlisted in the Australian Army at Fremantle on 14 September 1943 and was discharged on 29 January 1946 while serving in the WA District Accounts Office. After the war he worked for The West Australian newspaper (in the sub-editors' room) and died suddenly in hospital on 7 June 1951. Tributes published in the newspaper show that he and Vi had two children: Lois and Caroline Pearman who, according to Amber's website, later provided them with four grandchildren. Frederick and Estella's youngest son, Vernon Stewart Pearman, was born at East Guildford in 1919 and adopted by the Ottaway family the following year. The Department of Veterans Affairs' Nominal Roll for WW2 shows he enlisted in the Australian Army at Moora in WA on 25 August 1942 and was discharged on 20 March 1946 as a Staff Sergeant in the 28th Infantry Battalion. 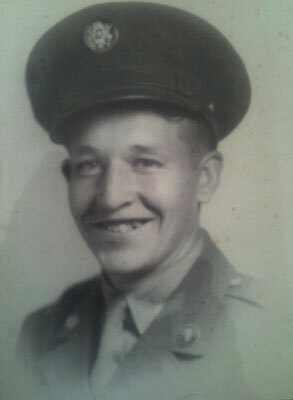 He married Emily Jean Hasson (1918-2006) in Perth in 1946 (reg no 1104) and has two children: Joanne and Peter Ottaway. 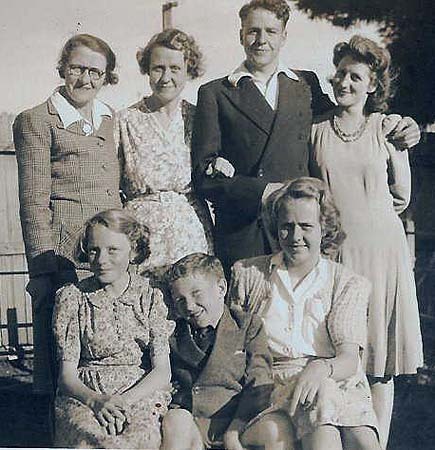 on the right has Tillie, Unknown, Fred and Joan standing behind Fred's sister, Norma Pearman (on the right) and two of Tillie's grandchildren. St Mary Church of England, Lamberhurst, private collection. 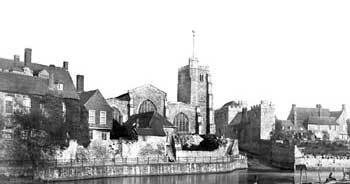 'All Saints Church, Maidstone c1862' from the Francis Frith Collection. 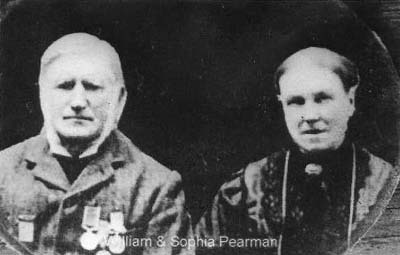 William and Sophia Pearman nee Hickmott, Albert Ernest Pearman and sons, and Bertie John's marriage all from Vyv Mathew's 'Family Trees of Pearman/Ball/Mathews/Evans' on Ancestry. Frederick James and Estella Pearman and family, courtesy of Amber Heath. 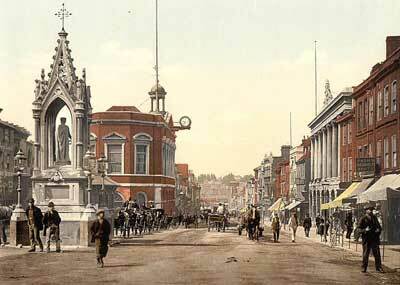 'High Street in Maidstone c1890' from Old UK Photos.